The opening night approaches as Garth Gratrix continues to build and install “Ready Retrispective”. 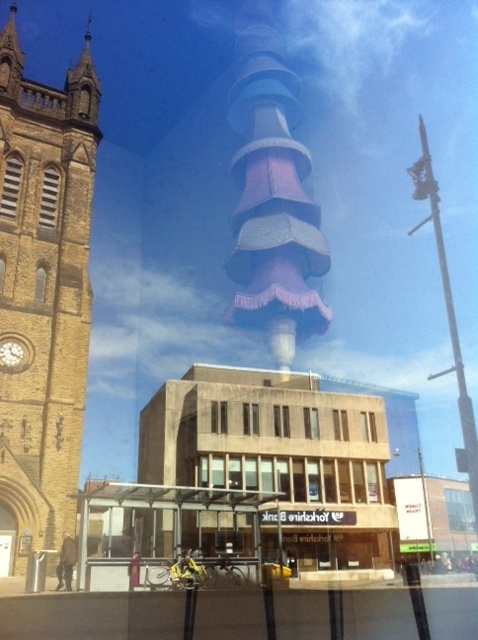 The lampshades almost look like part of the architecture as they reflect into the Blackpool landscape. Other features will include a selection of objects taken from previous intervention art pieces. The Farrow & Ball colour selected will invoke a monotone finish whilst the objects installed act as a subtle contrast to the space around them- showing the artists interests not only in the semi performative nature of objects arranged in space, but also within shape, colour and space itself. Garth Gratrix will be exhibiting his work alongside local artists John Marc Allen, Micheal James Cassidy and the Langdale Centre Photography Group from Friday 13th April at Bar Red, St Johns Square, Church Street, Blackpool. There will be a launch event at FYCreatives, Church Street from 6-8pm on Friday 13th April, with a tour of the windows at 6.30pm.